It had been nearly 3 years since Fat Bruce Lee and I last set foot in either of the Father's Office locations. We were enraged by that previous visit. We agreed that it was time for us to take a fresh look at the much-lauded, Los Angeles burger icon. We found free parking in the attached lot of the H.D. Buttercup complex. By 7:00 PM on a Tuesday, Father's Office was already filled to capacity, but we managed to score a table in the bar area. Fat Bruce Lee simply had to stare down a couple of patrons to free up the table. It was an uncomfortable scene, but it beat waiting. We ordered a couple of The Office Burgers and a single order of fries from the bar. We settled in for 15-minute wait and chatted above the din of the dimly lit, bustling gastropub. The Beef: The ground beef in The Father's Office burgers was, according to a recipe posted on MSN, a half pound of ground Chuck. The beef was fresh, juicy, bloody, and oily. The fat content seemed to be in excess of 20%. The burger meat in the oblong patties was moderately beefy. The beef was relatively uninteresting. The flavor worthy of note beyond the mild beefiness was a little iron. The burger patties were fine along the edges where the beef had cooked to a firm state. The center bites were soft and bland. The beef in these half pound cheeseburgers was fresh and juicy, but it was on the bland side. The Seasoning: The exterior of the burgers was mildly seasoned with something savory. This was more apparent around the edge of the patty. The seasoning was overwhelmed by a mass of cheese and onion jam in the center. It was only at the edges where the seasoning and beef were able to be savored. The Sear: Meh. What sear? Father's Office cooked the burgers on a too cool surface, which did the mild beef no favors. This oily burger would have really benefited from a thorough, deep sear. The Preparation: There wasn't much to get excited about in terms of preparation. The burger patties were hand-formed. The beef presented a loose mouth feel, and this demonstrated that the mild beef was not over-manipulated. Beyond that, the burger was cooked to a competent Med-Rare. Most worthy of note was the massive amount of onions and cheese on the burger. The toppings were heavy-handed. 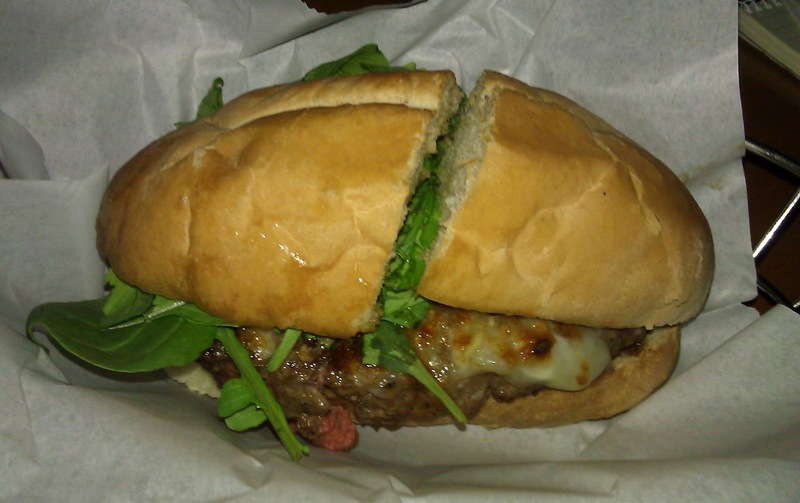 The Cheese: The burger at Father's Office was nearly obscured by a thick layer of chopped Maytag Bleu cheese. The Bleu cheese was topped with a thick slice of Gruyere. The cheese layer was about 1/4 inch thick. The combination of Bleu and Gruyere was nice. It created a firm and slightly grainy mouth feel. The Gruyere bonded to the Bleu, and this served to keep it from sliding off of the burger patty. The flavor of the cheese was simply too big for the mild beef. The thickness of the cheese layer was a distraction from the beef. The Office Burgers were more like cheese sandwiches than cheeseburgers. The Bun: The bun was a simple French Roll. It was savory and moderately yeasty. There was no need for a sweet element from the bun. The onions had that covered....abundantly. The bun was dry at the ends but fine once one got past that. There was no crispness, since the bun had only the scarcest hint of toasting. Perhaps the dryness of the bun played to the juiciness of the burger. The wet burger was mostly sopped up by the bun. In spite of that, I found myself wiping my hands with great frequency. The Meat To Bun Ratio: The beef, when combined with the thick, wet toppings cancelled out the bun and then some. My hands were uncomfortably greasy. The Toppings: The non-optional onion topping was, effectively, a marmalade of Vidalia onions and balsamic vinegar. This was overpowering. The sweetness and tartness of the onion topping was a distraction, which served to further obscure the mild flavors of the beef in this cheeseburger. In addition to the cheese and onions, Father's Office topped its eponymous burger with baby arugula. This was pleasant, mild, and nutty. The baby arugula resembled cress without the tanginess. 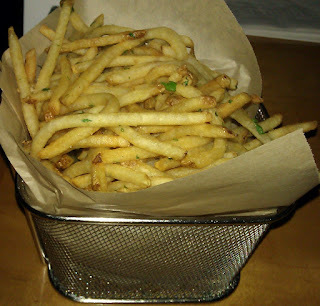 The Fries: The hand-cut, shoestring fries arrived far too long before the burgers. The fries were crisp, hot, golden, and perfectly seasoned. The fries were oilier than they needed to be, so that was a distraction. Beyond that, the fries were accompanied by an oily, garlicky aioli. It was well-documented that ketchup was verboten at Father's Office, so we didn't bother to ask. The Value: Fat Bruce Lee picked up the tab on this one, so I missed the pricing. I seem to recall the the burger was in the 12 dollar range. The burger was not accompanied by fries. The value for this wet, strongly flavored sandwich was not great. 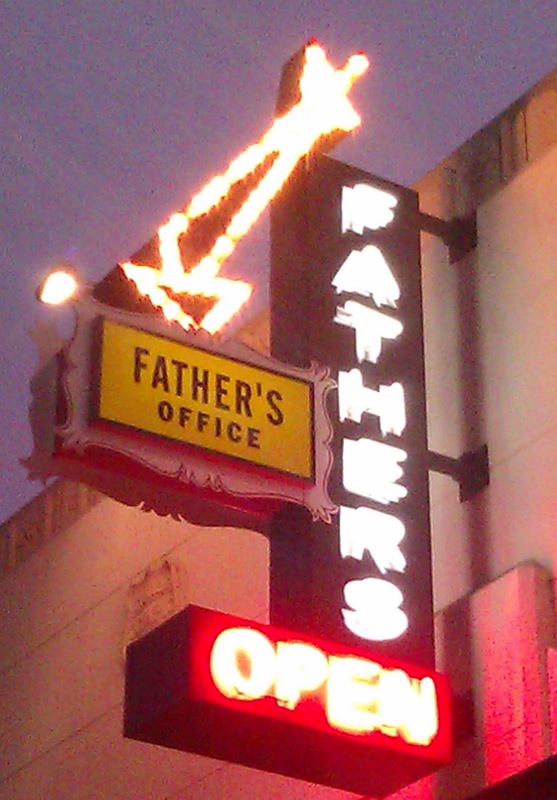 Father's Office had previously served up an inedible burger with awful service. In the past three years, it seemed that Father's Office had really ramped up their efforts. The burger went from awful to mediocre. Still, I can't, in good conscience, recommend this cheeseburger to anyone. Burger Review : An over-dressed, burger with flavorful toppings but mild beef was what we had at Father's Office. 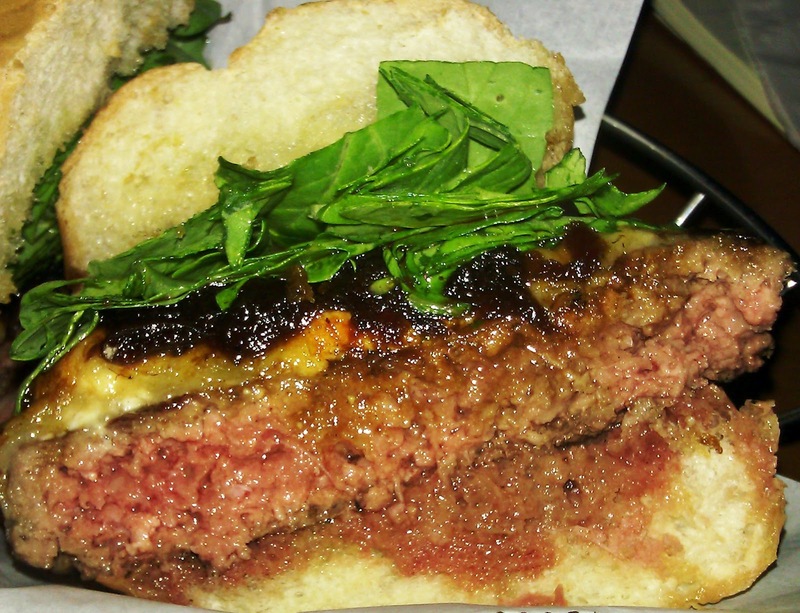 While the burger was improved, it simply was not good enough. Spot-on about the toppings overwhelming the beef. I've talked to a lot of people about this and it seems like folks are in one of two camps when it comes to rating a burger experience: purists who want a strong beefy presence vs those who enjoy the overall general flavor that the toppings give to the burger. 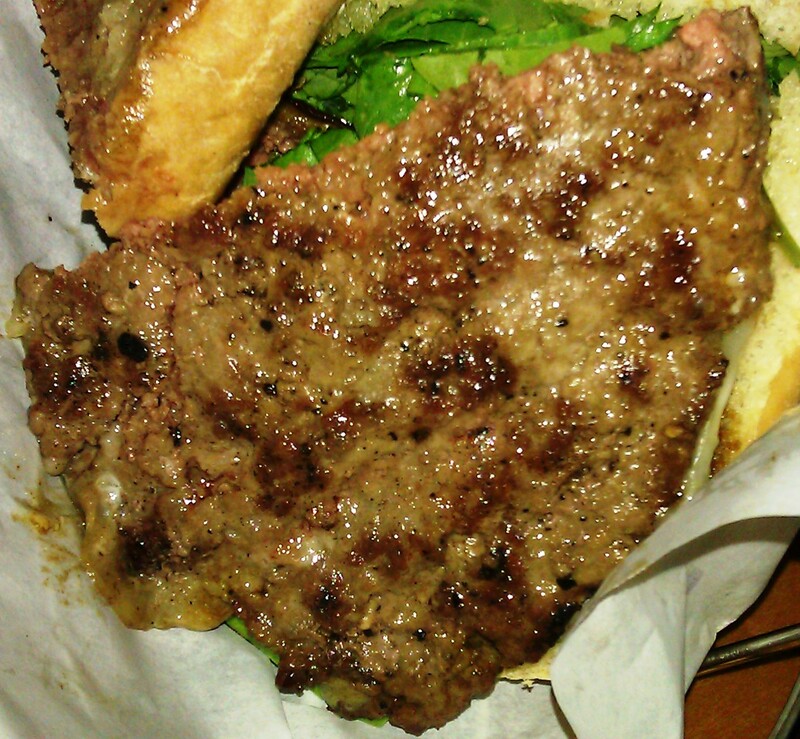 Whenever I compare notes with topping-lovers, they'd like the burger while I criticize the lack of meatiness. Not surprisingly, they all love Father's Office. Each to his/her own I guess. Thanks for the update on FO.